Police guarding this morning's crime scene until evidence technicians arrive. A man was hospitalized this morning after being stabbed near Belmont and Clark. A suspect is in custody. This morning's incident is the fourth stabbing in a week for our neighborhood. 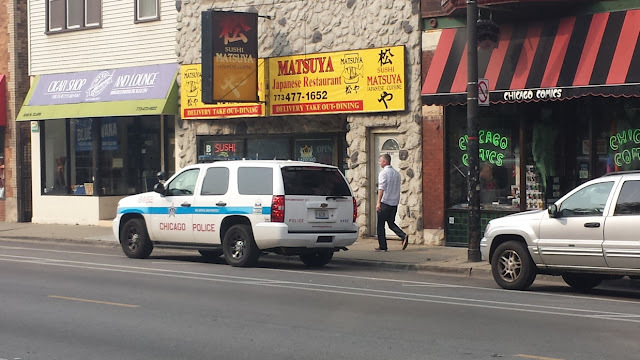 Police found today's victim lying in a doorway of a sushi restaurant at 3242 N. Clark around 5AM. A small pool of blood remained on the concrete there several hours later. Moments after police found the victim, CTA staff called 911 to report that a stabbing suspect had entered the Belmont Red Line station. Officers raced to the platform and arrested a suspect as he sat on a southbound train that was seconds away from departing the station. The victim told police that he was stabbed near the Dunkin' Donuts and was subsequently chased by the offender to the CTA station before he broke away and fled to the Clark Street restaurant entrance. According to police, the victim is in his late teens or early 20's. He is being treated at Illinois Masonic Medical Center. Today's victim is the fourth to be stabbed in separate incidents here since last Sunday. Three people were stabbed in the immediate area following last week's Pride Parade. We reported on two of those, but the Chicago Police Department Office of News Affairs claimed to be "unable to confirm" one incident that took place on Boystown's Halsted strip when other outlets inquired. • Stabbing, 1000 block of Belmont. Sunday, June 28, 11:00PM. Case #HY320060. • Stabbing, 600 block of Aldine. Sunday, June 28, 11:29PM. Case #HY319996. And this morning's stabbing is case #HY329421, should there be any challenges "confirming" it. In addition to those, a man was found lying on the ground in Boystown at 5AM last Sunday after getting stabbed in the 600 block of Montrose. Case #HY318982, for your convenience.